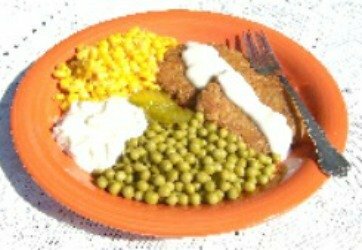 This Salmon Patties Recipe is an old fashioned recipe made with canned salmon. Included is a recipe for Roux Gravy and one for an easy and delicious Lime Tartar Sauce. I included an easy recipe for Salmon Patties On A Bun, very popular in a local restaurant. Salmon is one of the few foods containing Omega-3, an essential fatty acid that plays a crucial role in healthy brain function. Drain salmon reserving liquid. Place in a medium size mixing bowl. Remove skin and bones, if you prefer, scrapping them off with a fork or spoon. With your hands, shape into 4 equal sized balls. The mixture will be of a cookie dough consistency. Place balls on waxed paper and flatten each one into an approximately 2 1/2 inch diameter disk shape. Pour salmon liquid in a measuring container and add enough milk to make 1 1/2 cups total liquid. Set aside. Melt butter in a saucepan or skillet on low heat. Add in flour and salt. Cook while stirring until all lumps are gone from flour and mixture is bubbling. If you desire a white sauce at this point start adding the milk mixture to the roux in a slow stream while cooking and stirring. If you prefer a brown gravy let it keep cooking and stirring it until it reaches the brown color you desire. After adding the milk and the mixture has almost thickened to the thickness you like in gravy, remove from heat, cover and set aside. It will continue to thicken a bit as it sits. Add peanut oil to another skillet. Heat to 350 F. if you have a temperature gauge. If not test the oil temperature by dropping a small piece of bread in. If it browns in a couple of minutes, then your oil is ready. Carefully lower patties into oil. Cook 2-3 minutes until lightly browned and flip over with a spatula and cook the other side like you do pancakes. Cook 2-3 minutes until this side is browned. Remove patties from pan and lay on a platter that has 2 or 3 layers of paper towels on it to absorb excess oil. Cover the tops with additional paper toweling to remove even more fat. To serve this these cakes, place them in a dinner plate and top 2-3 tablespoons roux sauce. You may pour gravy into a gravy bowl and let individuals spoon on as much sauce as they like. Serve patties with plenty of Tarter Sauce and Cole Slaw. Vegetables that go well with this Salmon Patties Recipe are mashed or baked potatoes, sweet potatoes, mashed or baked, Green Bean Casserole, lettuce and tomato salad, Seven Layer Salad, or others of your choice. Generally, fried vegetables aren't served with Salmon Patties that are fried. Steamed or raw veggies go very well with it. Mashed white potatoes are an excellent choice. Stir lime juice into mayonnaise and mix well. Fold in dill pickles and juice and mix well. Store leftover sauce in a covered dish or jar in the refrigerator. *You can use bottled lime juice. I use the little plastic lime shaped containers found in the produce department of the grocery store. They work well and are economical as they can be stored in the refrigerator for a long time. **If you prefer sweet pickles over dill pickles you may substitute Sweet Salad Cubes pickles. They are especially good with a couple of teaspoons of malt vinegar added to the sauce. It gives the sauce a little tangy taste. Malt Vinegar is an excellent topping for any fried fish as well as for this Salmon Patties Recipe. I believe it is served at, or at least available upon request, in most all fish houses and restaurants. Open buns. Butter and toast lightly on both sides. Spread both insides of each bun with 1 tablespoon of Lime Tartar Sauce. Lay one hot Salmon Pattie on the bottom half of each bun. Top with slice of tomato and lettuce or spinach leaves. *** Many people think spinach leaves taste better. Spinach leaves do contain more nutrients. Spinach is also now considered a "Super Food" by many experts in nutrition. CROQUETTES - are small, round mixtures of chopped meat or vegetables coated with eggs and then bread crumbs and fried in deep hot fat. The above Salmon Patties Recipe makes "patties" -- not croquettes. GRAVY - is the juices given off by cooking meats such as roasts, hams, etc. or made by combining a roux with liquids such as these, milk or water. The above Roux Sauce IS a gravy. ROUX - is a cooked mixture of butter or other fat and flour (sometimes corn starch as in Cajun cookery) used as a thickener in gravies or vegetables. I made a Roux to start the above Roux Sauce or Gravy. SAUCES - are flavored liquids used to enhance not only the flavor of foods, but to add moisture and visual appeal. I'm making these again tonight. They were so good!